If you like to play it loud, this throaty 455-horsepower V8 droptop definitely delivers the decibels, blogs Road Test Editor Howard Walker. Krakatoa spewing lava doesn’t sound this vocal. Metallica playing Madison Square Garden? Not even close. Elon’s SpaceX lifting off from Canaveral? A baby’s whisper by comparison! So what’s the source of this ear-bleeding tumult? 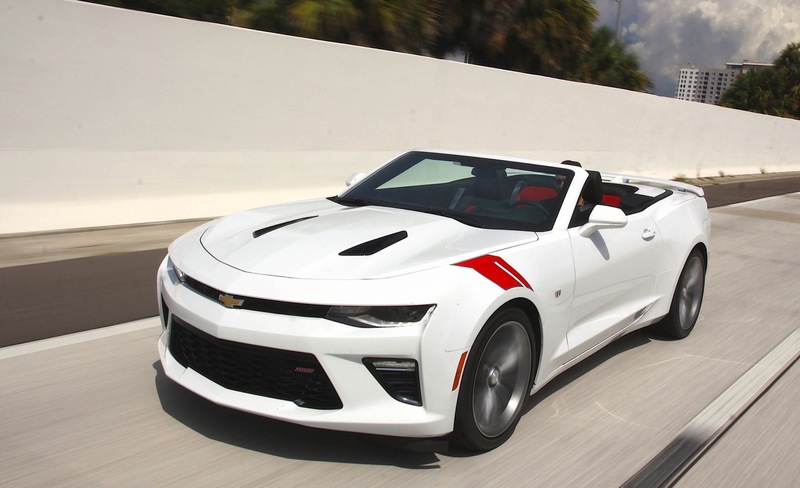 That would be the ‘18 Chevy Camaro SS convertible I’ve been driving. It’s what happens when you squeeze a thundering 455-horsepower 6.2-liter LT1 pushrod V8 under the hood and you check the box for the optional $895 Dual Mode Performance Exhaust. I bet it’s the same muffler Jimmy Johnson uses for his NASCAR Chevy. To enjoy the full aural overdose you need to first complete a couple of tasks. The most important; drop the top. 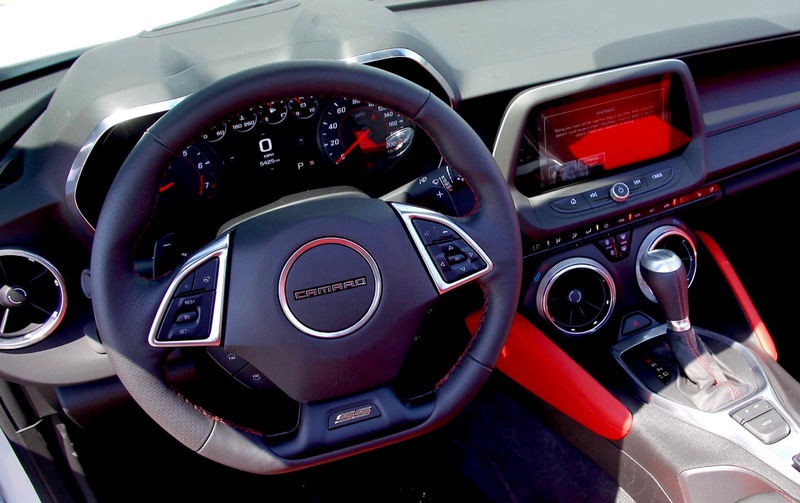 Toggle a teeny rocker switch on the windshield header, and the Camaro’s tight-fitting cloth lid will unlatch and power back in around 20 seconds. And you can do it at speeds up to 30 mph. It comes with a neat party trick that lets you lower the top remotely by holding down a teeny button on the key fob. Pretty cool when the inevitable bunch of gawkers is checking out the car and you hit the button from a distance. And, as the top descends into a well behind the rear seats and is covered by a hard tonneau, it all looks very neat and tidy. Next, you need to scroll through the drive control modes courtesy of a switch on the center console. Skip the Snow/Ice and Touring settings and go straight to Sport, or Track for gears to be held longer. Now just stomp on the throttle, watch the revs soar on the big tach, and listen, almost in disbelief, as the quartet of polished, big-bore pipes spit-out the most raucous, barely-legal, verging-on-the-obnoxious cacophony. How does it sound? Absolutely. Freakin’. Amazing. All these vocals wouldn’t mean a thing if it didn’t have the velocity to go with it. And this Chevy SS ragtop is fast. Click the stopwatches and sixty will come up from rest in a hair over four seconds. Zero to 100 mph? Bang on nine seconds! Of course you don’t have to drive it like you stole it. Toggle back to the Touring setting, go easier on the gas, and the big Chevy becomes the King of Cruise, waffling along using the lovely combo of 455 pound-feet of muscley torque and a smooth shifting 8-speed automatic. 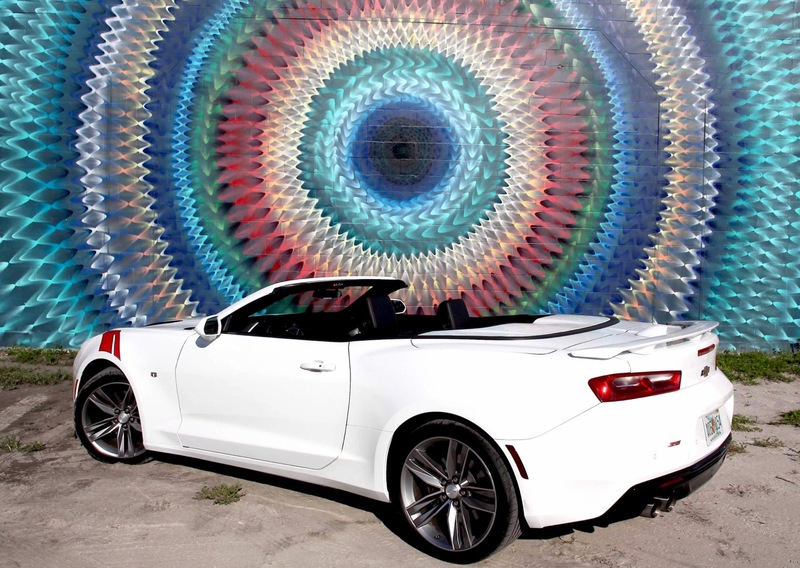 And the days of a Camaro convertible shimmying and shakin’ like an out-of-balance Maytag washer-dryer on spin cycle are long gone. An X-brace in the middle of the floorpan and a Y-brace at the rear make for a body that’s stiffer than a Buckingham Palace guard. Even with wafer-thin 20-inch rubberware at each corner, the chassis and suspension soak-up lumps, bumps and potholes with hardly a jolt or jiggle. Pretty impressive. That super-stiff chassis also helps give the car an agility and athleticism that belies its porky, 4,000-pound bulk. 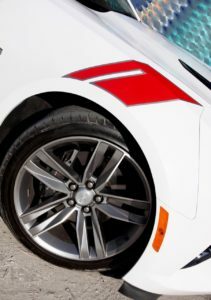 Thanks to nicely weighted, super-precise electric-assist steering, a drive-mode selector that tailors steering effort and damper stiffness to your mood, and the Camaro carves curves like Lindsey Vonn on the downhill. And if you like numbers to back-up the subjective, look no further than the quite-remarkable 0.96 G of lateral grip. Just make sure you hang on to your Big Gulp! A pair of front seats that hold you in place tighter than a hug from Hulk Hogan also aids enthusiastic cornering. Big side bolsters, just the right amount of shoulder support, and eight-way power adjustment for the driver and six for the co-pilot, add-up to terrific comfort levels. Did I mention seat heating and ventilation comes standard? Depending on your taste – or maybe lack of it – an extra 195 bucks gets you contrast color leather panels for the seats. In the case of our test car, it was fire truck red with red contrasting stitching and red door panels. Boudoir-ish yes, but still a lot of fun. While levels of materials-quality, tactility and fit and finish are still a country mile away from Audi or Mercedes, Chevy has come a long way. And I heard not a squeak, or rattle the entire week I shared with the car. OK, there are things that will have you shaking your head in despair: The lack of any sort of rear-seat legroom despite the car having two big seats. The lack of any meaningful rearward visibility when the top is up. Nasty plastic paddle shifters with the structural rigidity of dried twigs. And a driver’s sun visor with a no-cover for the mirror. All that said, I loved this SS convertible. Loved its sound, loved its fun-to-drive, top-down vibe. And loved the sticker which starts at $48,000 and, for my loaded test car, topped out at $52,800. 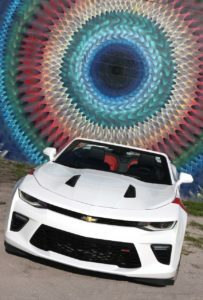 What’s more, with a slightly redesigned ‘19 Camaro waiting in the wings – it has a new front and rear look, new 10-speed auto, and new multi-media system – dealers are offering big discounts on the ’18s. Talk about bang for the buck. No, make that a huge bang.